Strength, as an isolated quality, can be defined and measured as the biological contractile potential of muscle–as how hard your muscles can contract to apply force. This is what body builders like to use. But from our perspective, Coach Glassman explains that is an incomplete definition and an isolated measure that doesn’t really reveal much about its application to real-world functionality. Meaning, useful strength is not merely the muscles’ ability to generate force but a body’s ability to productively apply that force. The missing link in so much mainstream fitness programming, from bodybuilding to monostructural endeavors, is the neuromuscular piece–in particular, the development of coordination, accuracy, agility, and balance. We can sum these elements up as “technique.” Omitting them from one’s training necessarily results in only partial fitness, partial expression of one’s genetic potential, and a decreased threshold of maximal capacity. 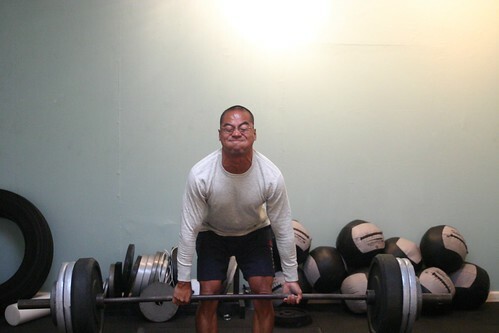 To increase work capacity across broad time and modal domains (the goal of CrossFit), technique is the crucial connection–whether your goal is to win the game, protect your life, complete the mission, or just be fit for the demands of everyday life at any age. There is no time component to this WOD. My suggestion is around 5 minutes between rounds.